Following in the footsteps of a famous parent is never easy  ask Julian Lennon or Pete Rose Jr.
And so A.J. Croce, son of the late, legendary folk singer Jim and famed San Diego restaurateur Ingrid, has spent the past 13 years recording and performing while never quite establishing himself in the public's consciousness. It's no lack of talent  Croce is possessed of a warm voice and can ably accompany himself on piano or guitar. He's also a songwriter of no mean talent, with a rare ability to turn out small gems of pure pop music. His new album features Croce in company of such luminaries as Ben Harper and San Diego icons Steve Poltz and Gregory Page, playing a breezy, guitar-and piano-based brand of pop. Several of the songs are quite good  "Play" has as infectious melody as you'll hear; "One and Only" is quirky but fun. But the third track is downright bizarre  a cover of Paul McCartney's "Maybe I'm Amazed" that is a note for note copy of Sir Paul's original down to the piano solo and vocal decorations. It's as if Paul came down sick mid-concert and Croce filled in for him. It leaves one to wonder why Croce would bother performing a song if he didn't want to bring something new to it. 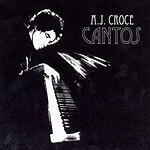 Perhaps that track hints at Croce's seemingly inexplicable lack of mainstream fame: He can not only do a great knock-off of McCartney, but elsewhere sounds like Simon and Garfunkel, George Harrison and Elton John  leaving us to wonder just what A.J. Croce sounds like. There is no stylistic consistency from song to song, much less album to album. And even that wouldn't necessarily be a bad thing, if only there were something tying it all together, some characteristic that said, "This is A.J. Croce music." Minus that, Croce continues to be a pleasant enough presence on the music scene, providing us the occasional pop nugget  and leaving us with the nagging feeling he could be so much more.